Am jealous of your find! 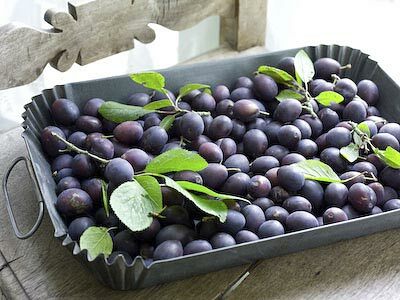 Damson jam has to be one of my favourites and I would be tremendously excited to happen across some growing in the wild. I have a damson bush in my garden but it stubbornly refuses to fruit. Sigh. Damson jam IS my favourite and this year is a really good one.I was very sad to read an article at the weekend bemoaning the loss of yet more orchards,partically of damsons.They are not a commercially available fruit and can be variable in terms of crop but when they have a good year the freezer is full to overflowing.Perhaps Hugh or Jamie should start a campaign to save our native fruit trees.Can I recommend you take out an old walking stick,Gloria.As children we never went to pick blackberries or apples inc.crab, with out a stick.Great for hooking those really prickly stems or lowering branches. 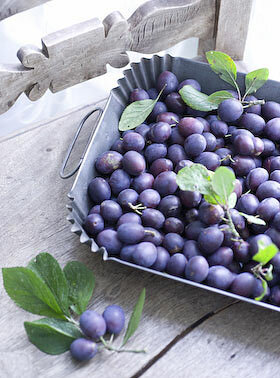 daily spud, damsons grow on spikey untidy trees, perhaps your bush is a sloe. there are plenty for you if you need more. Oh, how lovely! I wish there was more wild fruit around the area in which I live! Hi, I have just stumbled upon your website whilst trying to identify a huge crop of what we hoped were damsons found on a walk in our local woods. Judging by your photo and the leaves I collected we have hit the jackpot!! I cannot wait to try some recipes with them and go back for more – the tree is huge and no-one seems to know what they are as it is absolutely brimming with fruit. Thank you for having such a fantastic website!